Connect the dots among market events and market forces that are invisible without artificial intelligence assistance. Project market strategies into the future. Create and track new investment plans. 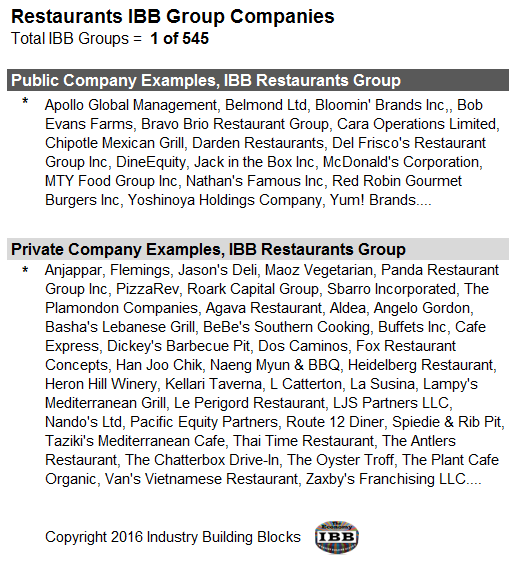 The IBB database organizes the world economy into 19,200 ultra-granular industries. Thousands of companies are mapped to unique lines of business. Competitive relationships are revealed. 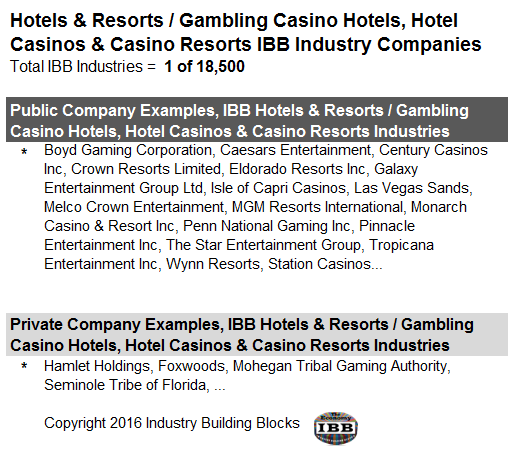 Industry Building Blocks is the creator of this database. Themes are the sum of countless market events that are connected – even if not visible without AI assistance. Thousands of news, blogs and other unstructured inputs are some of the the raw inputs for our intelligent agent engines. Our servers conduct billions of daily competitive relationship seeking calculations. Market event dots are connected over long periods to discover and track market themes. Our artificial intelligence agents highlight the interesting themes, discarding the noise. Our analysts assist our AI with supervised machine learning. They also validate changes to IBB database. Most importantly, our analysts deliver strategic and tactical market intelligence to our clients – leveraging the powerful AI theme discovery network. Themes are early indications of market directions. 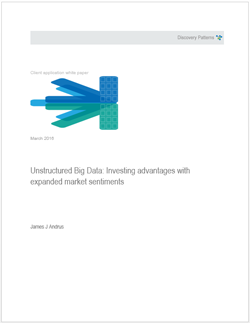 Discovery Patterns enables investors and analysts to leverage theme discovery artificial intelligence as a competitive advantage. Artificial intelligence makes first discoveries; analysts track with domain specific expertise. Green – themes being validated; red – being refuted over past 90 days. Animations of AI agent outputs. Key themes win radar center over time. Semiconductor sensors & devices are key drivers for all IOT innovations. Augmented reality is becoming a key perception gateway for IOT analytics. Network Security is a key competitive position for Cisco in cloud computing. Amazon is a top 3 cloud infrastructure competitor with its various AWS offerings. Introduction of Google devices like Pixel smartphone and Google Home assistant accentuates the importance of Google Cloud infrastructure. Microsoft with its Azure is a top 3 cloud infrastructure competitor. Electric Vehicles (EV’s) will be limited to urban shuttles until 2020. Diesel will be major alternative to gasoline based on its engine efficiencies. Voice commands will be required for next generation of robots. Drones are the leading manifestation of next generation robotics. AI for superior investor/analyst decisions in the era of big data. Oliver Wendell Holmes, Jr. once said “I would not give a fig for the simplicity this side of complexity, but I would give my life for the simplicity on the other side of complexity.” All classification systems are products of simplicity based on complexity. The overarching trend of the basic sciences like chemistry, biology and genetics are ever granular investigations at the, atomic, species and genetic levels. These complex and granular investigations reveal the fundamental and simple patterns of nature. And once these fundamental patterns are discovered, it is possible to predict missing pieces and predict future outcomes under innovation, evolution, interaction or stress. So too with recent advancements in business data. 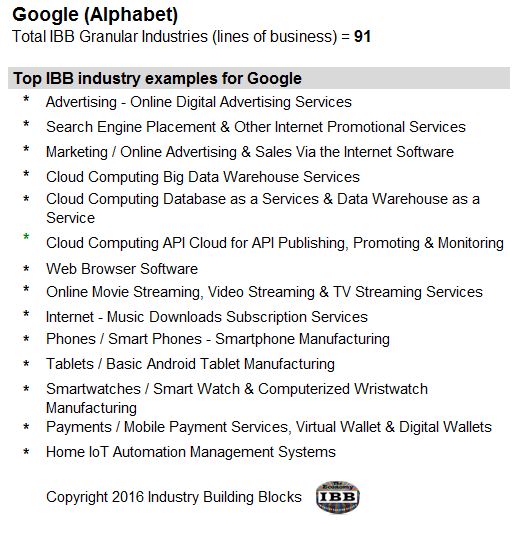 Through the application of IBB, an ultra-granular industrial classification system, it is now possible to distill great complexity into simplicity and make early market discoveries of companies and industries as they evolve and morph under competitive innovation, evolution, interaction and stress. 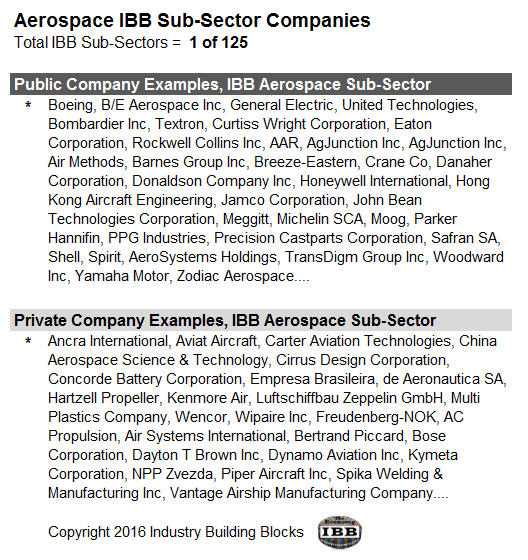 This paper will first define the ultra-granular industrial classification system IBB, in the context of existing scientific and industry classification systems. 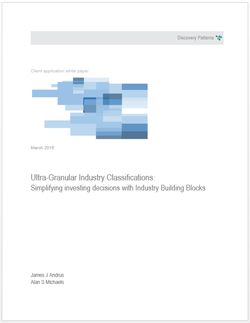 Then this paper will demonstrate simplified investment decision making on the other side of ultra-granular industry complexity. Useful context is the latest frontier of Internet information. Google is pioneering the next stage of Internet search with its Knowledge Graph, which aims to understand the searcher’s intent and the contextual meaning of his/her search terms . Facebook has been developing its Social Graph for people to people context by learning the personal relationships of its users. 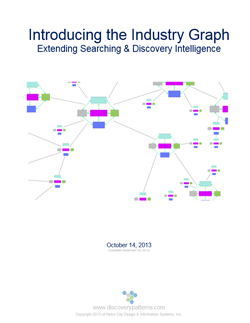 Now the Industry Graph, created by Industry Building Blocks (IBB) and Discovery Patterns, is another source of useful decision making context. The Industry Graph is being developed to serve competitive strategy and financial decision making. The Industry Graph first creates useful competitive context around the companies competing in 16,000 granular industries. This high degree of granularity enables useful intra-industry and inter-industry financial and strategy analyses. The Industry Graph creates a real time situational awareness by prioritizing unstructured information like news and social media that might indicate interesting industry trends or changes within the industry composition and broader inter-industry ecosystem. This Industry Graph context is the foundation for superior searching, discovery, competitive analysis, situational awareness, market anticipations, financial tracking and investing strategies. Our artificial intelligence agents for theme discoveries are designed to be trusted assistants to any decision maker who must survive in competitive marketplaces. They are smart and cost effective. They have the advantage of leveraging our IBB ultra-granular classification system that is a starting point of seeking what should naturally be occurring in a marketplace. Designed around natural human neurosciences, our theme AI also leverages the amazing power of eye-brain awareness for competitive survival. We transform unstructured big data streams into real-time competitive patterns that are either evolving or dissipating. Patterns can be simple text discoveries or graphical representations that resonate the powerful threat/opportunity pattern detection centers of the brain, thereby significantly enhancing competitive awareness. Most of the world’s market intelligence is hidden in overwhelming flows of news, blogs, texts, Tweets, social media and multimedia. 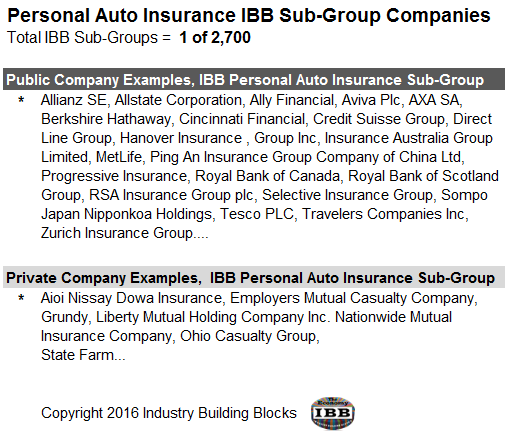 All these are examples of unstructured data. This data is messy and unorganized, unlike the clean structured data that is produced in industrial monitoring. We have invented a unique solution. We build portfolios of automated analytics distill theme discoveries and other situational awareness insights with our unique IBB context engines, discovery analytics and visualizations. No other analytic provider has these market intelligence competencies. The problem with the big data analytics, is that they were designed first for computer cycles – not the human awareness needs of managers and analysts. The results are complex tool kits and dashboards best suited for data scientists, thereby removing the decision makers from the original data and the real-time interpretation process. Our intelligence services are designed for immediate client consumption without the need for client data scientist pre-processing. There are article tagging services that immediately characterize the contents of news articles and social media for the purposes of automated machine trading. These services are done at the each or article level, not connecting the dots among hundreds of potential articles for market theme or trend evolution over time. Sends us a note so we can continue our explanations in person. We create and maintain public and private networks of artificial intelligence agents for market intelligence / theme discovery and tracking for our clients. These are yearly subscriptions that provide access to our several types of themes, including IBB classifications, briefings, smartphone apps, animated visualizations and personalized digital assistants. In many situations, our human analysts support weekly client briefings. Clients can gain immediate (same day) market insights, from our cloud based services without the need to recruit their own supporting analysts and data scientists.